Lo Hei is one of those fun things you get to do during Chinese New Year – a significant tradition of tossing food in the air – which goes against everything your mummy has said since you were young. 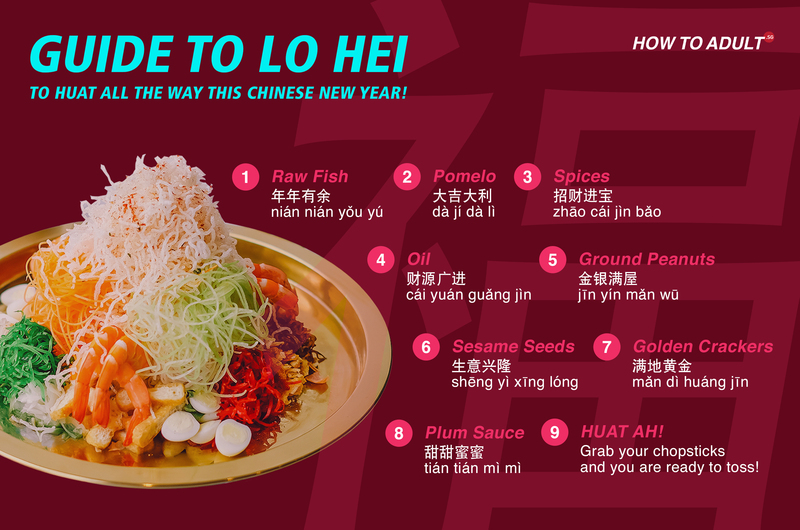 Lo Hei in Cantonese, where “lo” means “rise”, refers to the ritual adopted in Singapore of tossing the Yu Sheng and saying auspicious phrases before eating it. It is also known as the Prosperity Toss. 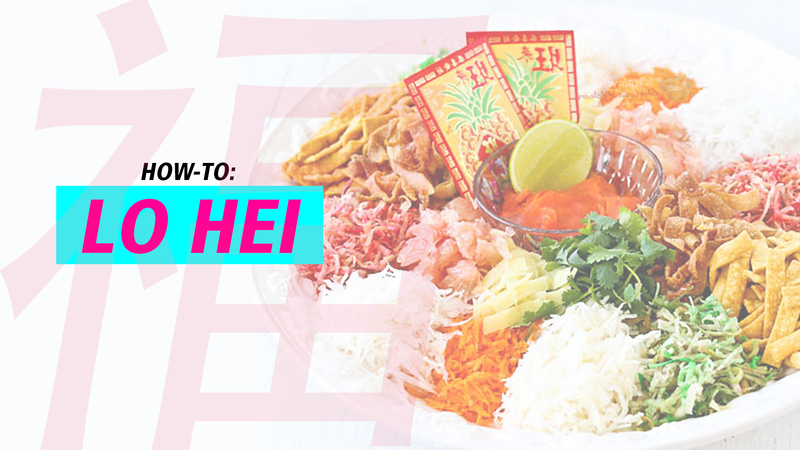 We’ve put together the typical ingredients that go into the Yu Sheng, along with the auspicious phrases to say, so you’re now one step closer to impressing all your relatives this Chinese New Year. It’s time to HUAT HUAT HUAT! Step 1: Place the Yu Sheng on the table with everyone gathered and offer New Year greetings. Step 2: Place the raw fish (i.e. salmon) onto the shredded carrot and radish. Meaning: May you have abundance ‘excess’ through the new year. Step 3: Add the pomelo/squeeze lime over the raw fish. Meaning: May you have good fortune and luck. Step 4: Dash spices (i.e. pepper and cinnamon) over the ingredients. Meaning: May there be greater wealth in the new year. Step 5: Pour the oil in a circular motion around the ingredients. Meaning: May money flow in from all directions. Step 6: Dust ground peanuts on the dish. Meaning: May the household be filled with gold and silver. Step 7: Add sesame seeds quickly into the dish. Meaning: May your business prosper. Step 8: Add deep-fried golden crackers. Meaning: Literally the entire floor would be filled with gold. Step 9: Pour the plum sauce on the dish in a circular motion. Meaning: May you have sweet and loving relationships. Step 10: Finally, grab your chopsticks to toss the Yu Sheng 7 times with loud shouts of auspicious New Year wishes. Remember, the higher the toss, the better the year ahead! Huat ah!